I have been trying to learn these concepts from a long time. Read many good articles, their definitions, but could not make much out of them. Finally, I decided to write my understanding that I have got from these resources. So in this article, I will share my learning about what are O.W.I.N. and Katana and will also try to get into some basic details that makes them important concept to be learnt. So let's start with their basic definitions first. 2. Remove the dependency of web server to host a component, by promoting the use of self-hosting. We will discuss about these points, later in the discussion. Next the question comes what is Katana and how it is related to the OWIN ? The answer is that if OWIN is a specification (and not any technology or framework), than Katana is an open source project by Microsoft based on the OWIN. One such example is the asp.net webapi, based on the OWIN specifications, supports the concept of self-hosting for hosting, by using the OWIN custom hosts(we will see the custom host concept in further discussion) and eliminating the dependency on IIS for hosting. So to conclude this part of the discussion, OWIN is a specification and Katana is Microsoft's open source project which uses these specifications. OWIN introduction allowed any OWIN-compatible application to talk through OWIN to a web server that had an OWIN-compatible hosting layer. Microsoft wrote Katana as one OWIN implementation that could host ASP.NET Web API, ASP.NET SignalR, and many 3rd party frameworks on top of several servers, including IIS (and IIS Express), Katana's self-host server, and custom hosts (i.e. run Katana's host in a custom app). This means that Microsoft's Katana project allows the use of the OWIN specifications by providing not only new servers like Katana's self host server, custom host server (like any windows service or console application) but also with existing web servers like IIS & IIS express. Let's discuss these layers in detail now. § IIS : This includes the use of IIS as the host for any application. In such as case, Microsoft.Owin.Host.SystemWeb is to be used as the Server. 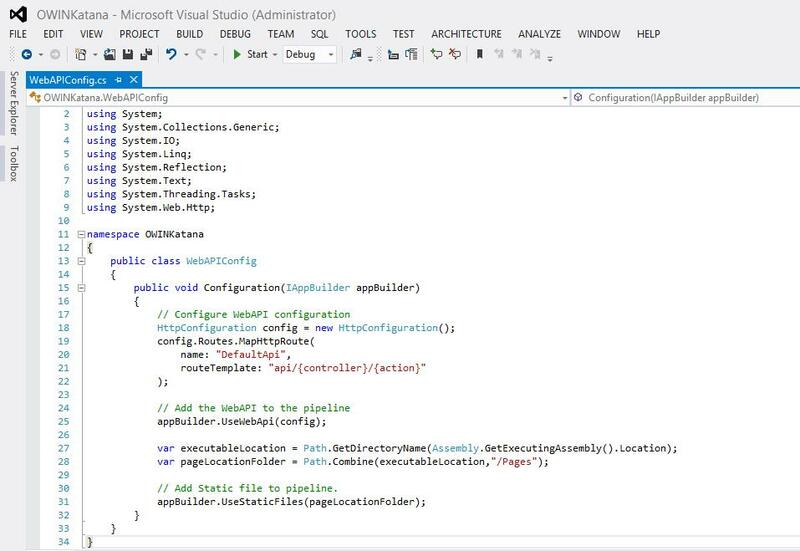 This will allow to add any OWIN compatible component or middleware to be easily added/remove from the pipeline. 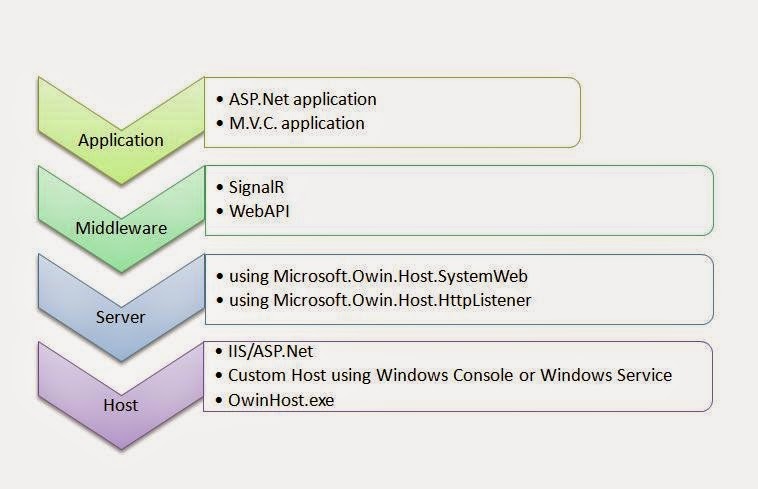 § Custom Host: This involves creating a windows service or a console application and using it to host your OWIN compatible applications like SignalR or Webapi. 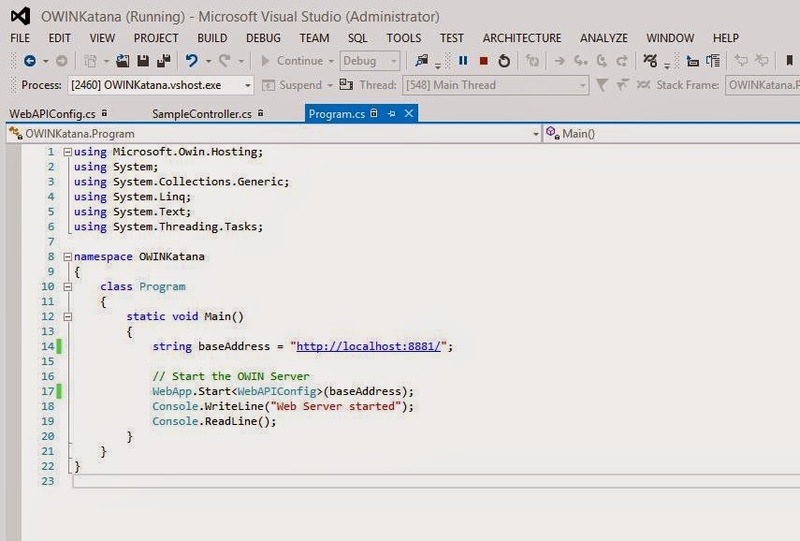 An example is self-hosting the webapi in a Console or windows application. See an example here. § OwinHost.exe: This is an executable file named OWIN.exe. It can be directly run and used as a host for any application. 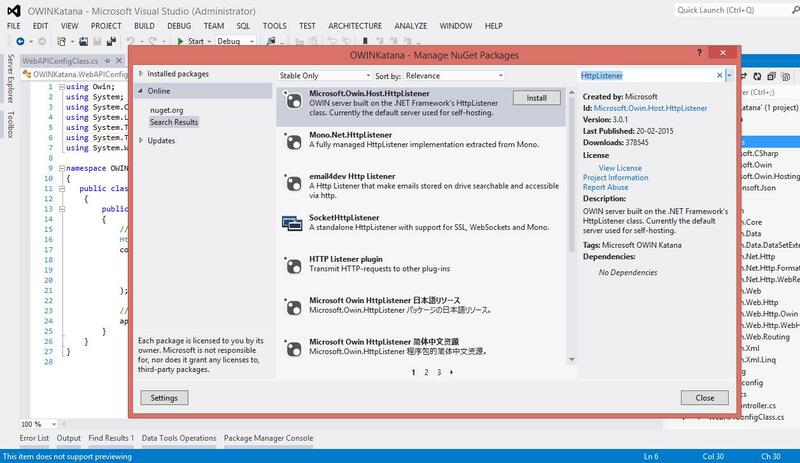 The Katana SystemWeb host registers an ASP.NET HttpModule and HttpHandler to intercept requests as they flow through the HTTP pipeline and send them through the user-specified OWIN pipeline. § Microsoft.Owin.Host.HttpListener: This involves the use of .Net frameworks' HttpListener class to open a port and manage the request pipeline. § By using Microsoft.Owin.Host.SystemWeb as the server implementation, we make use of IIS as the host as well as the server. § By using Microsoft.Owin.Host.HttpListener as the server implementation, we can use any custom host like windows or console application as the host or even the OWIN.exe executable as the host. 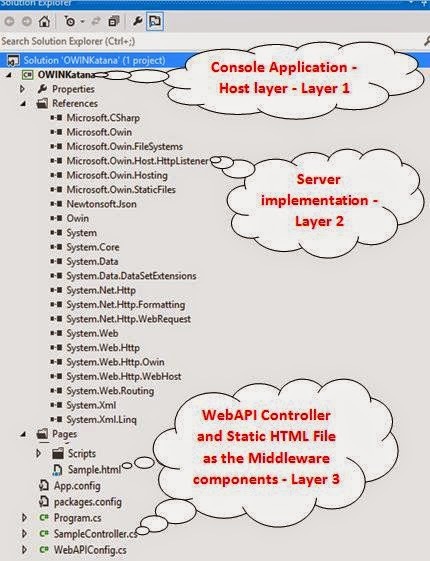 Middleware Components: These are the OWIN compatible components like SignalR and WebAPI and even static html pages. These are added to the system as plug and play components and can be easily added/removed without affecting the other modules. When the server receives any request from the client, it is passed through these components. Applications: This could be any of your ASP.Net, mvc or any other applications. 1. Custom host in the form of a Console application. 2. 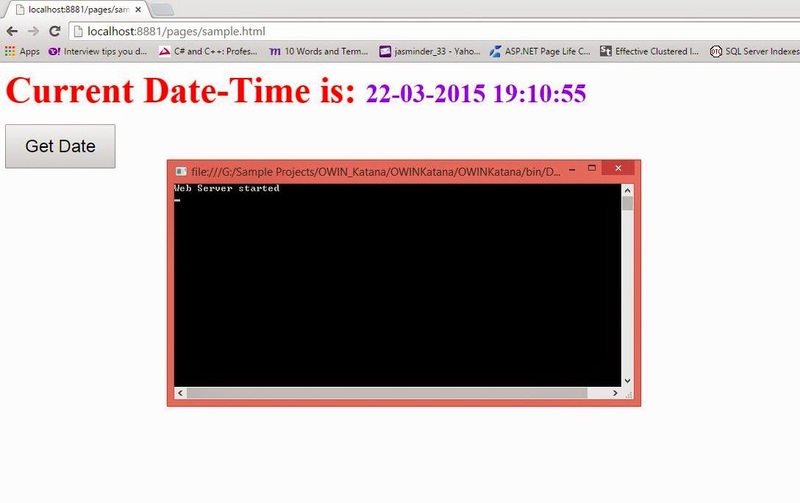 Microsoft.Owin.Host.HttpListener for the server implementation. 3. 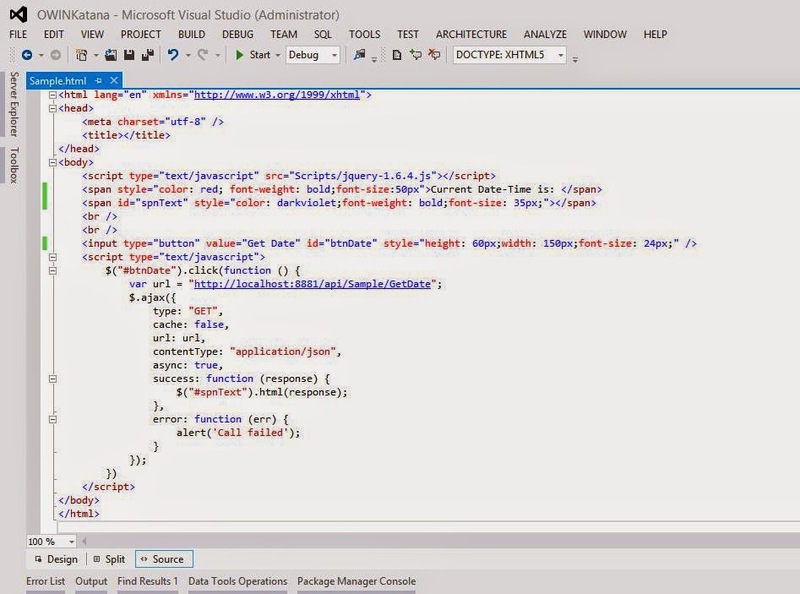 WebAPI and an HTML page as the middleware components in the system. An option could have been using any mvc or asp.net page as separate application in place of the html page. Then it would have acted as the 4th layer of the system i.e. Main Application. Another important point is, using any asp.net or mvc would not have been a good option as this would than not be hosted through custom host or used the Microsoft.Owin.Host.HttpListener server implementation. This is the reason i have highlighted it to be used as a separate application. Start by adding a new console application. This will be the first layer or the custom hosting the system, instead of IIS. 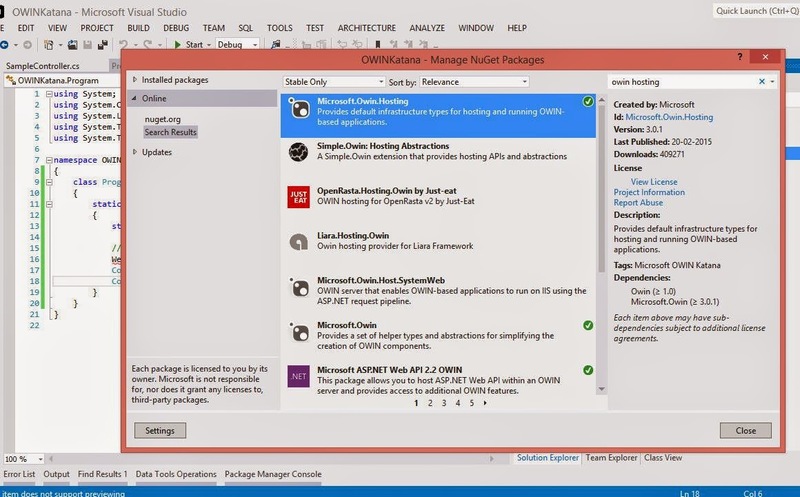 Add the references to the Microsoft.Owin.Host.HttpListener by using the nuget package manager. This would then meet the requirement of a server implementation. So we have the host and server in place. Next, we need to add the middleware component webapi. 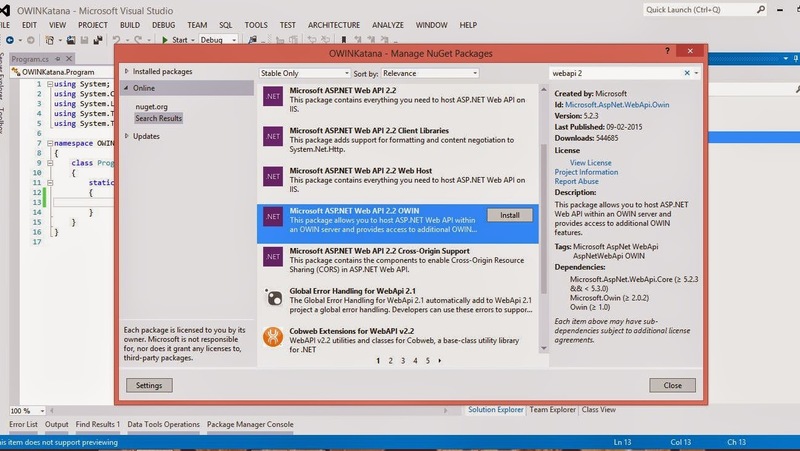 So we add reference to the webapi2.2 OWIN package, using the nuget package manager and OWIN hosting libraries. Next, we add another middleware component. This time, its libraries to add support for hosting html pages. Yes that's correct. We will host html pages in a console application. So let's see how we can do this. So now let's configure these components one by one. 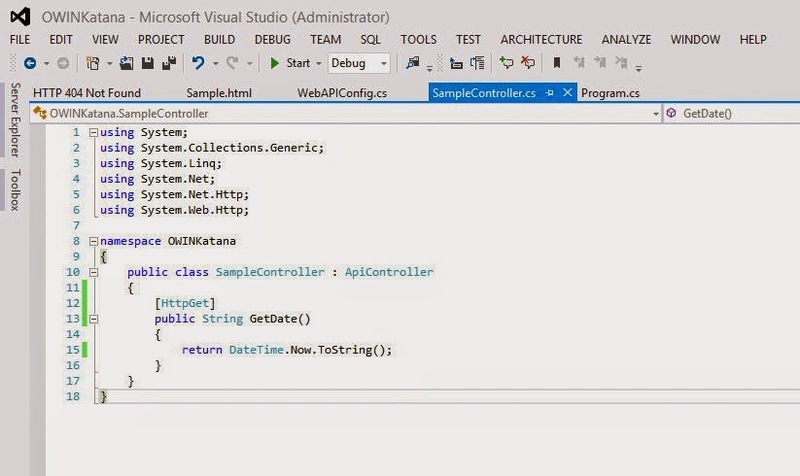 First, add a simple method in webapi controller, which returns the current date-time string. This will be called from the html which we added above. Final step, add some html to the html page and call the webapi method to get the date from the server. All done. Now start the console application and you can than browse the html page on the same url, as that of web api. Click the button and your request will be sent to the webapi. So now you can host the html page in the console application as well. Further if you tomorrow if you need to add the SignalR functionality, simply add the references and configure it in the WebAPIConfig.cs file like we did for the webapi and the static files. Further, if we need to provide the service api to any third party, simply host that in the console application or windows service. 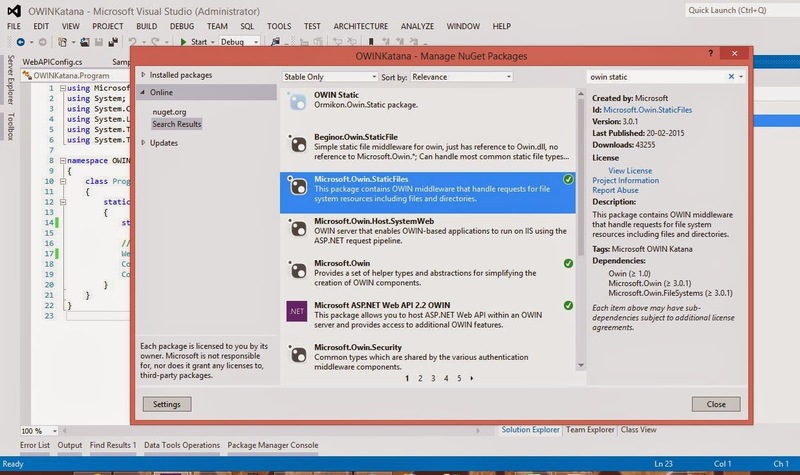 No dependency on the IIS. 4. Step by step configuring components in OWIN pipeline. Hope you will find this article helpful and enjoyed reading it. This is a new concept to be learnt. So i would love to hear about your feedback/additions to this concept. Source code for this article is also attached here. Happy coding...!! !